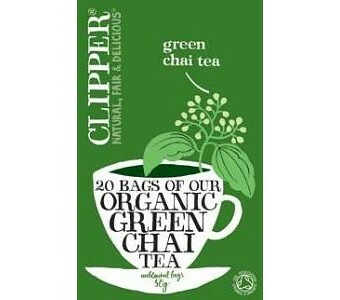 A traditional blend of green tea with warming spices, Clipper Organic Green Chai is grown using only natural methods of cultivation. The light flavour of this superb single garden green tea combines perfectly with Indian spices to give a wonderfully delicate and incredibly refreshing tea with warming spice overtones. Ingredients: Organically grown green tea, organic cinnamon, organic orange peel, organic cardamon, organic cloves.